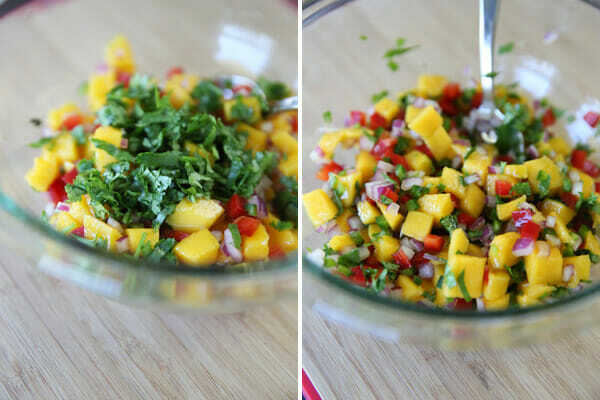 next day we had leftover mango salsa and I had about 20 minutes to get my family fed before heading off somewhere and this recipe was born. It was a total throw-together thing, but they were so good we ended up making them again just a few days later, annnd one more time the next day. 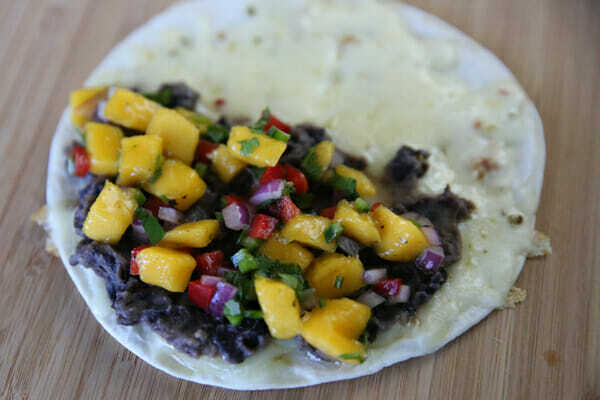 My kids love black beans, and this is a super-duper short cut version, that packs flavor with minimal effort. Because the beans are flavorful and filling, you can get away with this being a meatless meal, although you could easily add some shredded chicken, beef, or pork to bulk them up. The contrast of the sweet juicy mango, complimented by ooey-gooey melted cheese and a golden brown toasted tortilla is perfection. They make great party food or appetizers, too! Some of my most favorite (and most used, as you probably already know) ingredients. 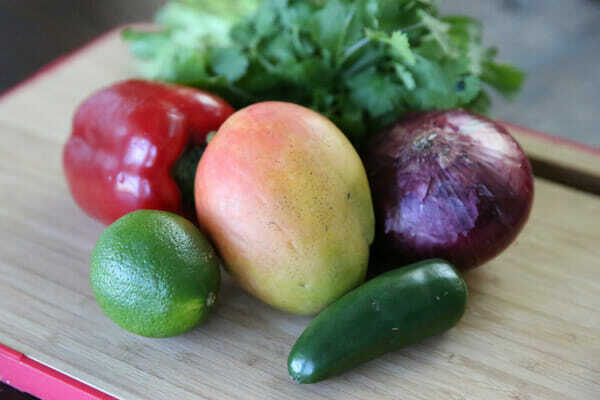 Chop up some red bell pepper (you could sub yellow or orange if you need to, but not green), red onion, a little jalapeno, and a fresh juicy mango. 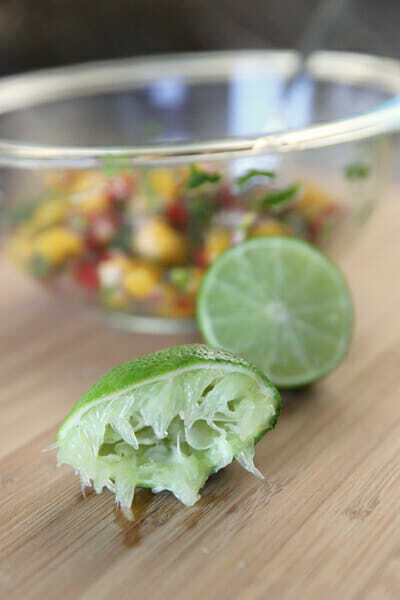 and a squeeze of fresh lime juice. Pop that in the fridge for a few minutes while you prepare the rest. Now I love black beans, and I especially love slow-cooked black beans that soak in flavors as they simmer all day. My my quick and easy version on the stove top is hard to beat, but we’re going even easier than that! Canned black beans are already nice and soft, so we’re going to let the microwave to the work here, and it only takes a minute or two. 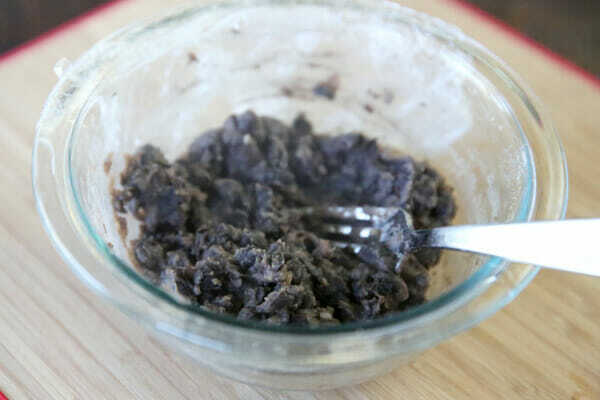 Just place a can of black beans (that has been rinsed and drained) in a microwavable dish. Add a little water or broth and a few seasonings, like garlic and onion powders, cumin and coriander, and give them a quick cook in the microwave. When they come out, use a fork to just mash them up part way. 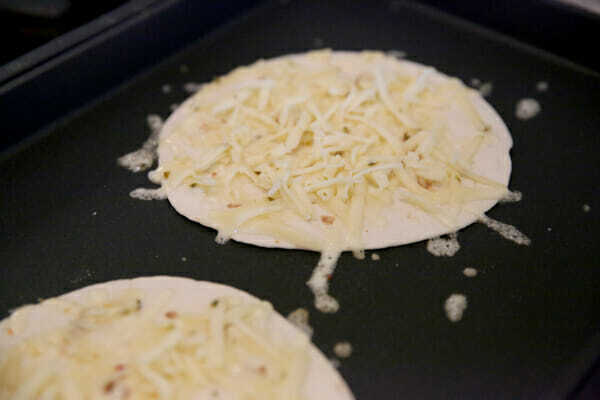 Heat up some flour tortillas and toss on some pepperjack cheese. If you want your tortillas to get nice, golden, and crisp on the outside, brush them with a little canola or olive oil first. Non-stick spray will even do the trick. 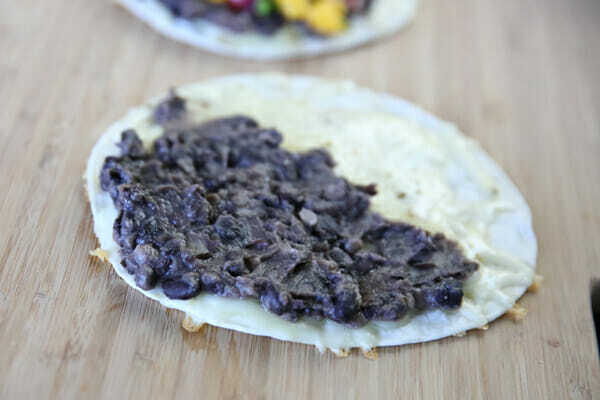 When the cheese is melted, remove the tortillas from the heat and spread black beans on one half. That seriously took, like, less than 20 minutes start to finish. Top with a little sour cream if you want (and why wouldn’t you want?) and serve. These make awesome appetizers too. Preheat a non-stick griddle or skillet to medium high heat. 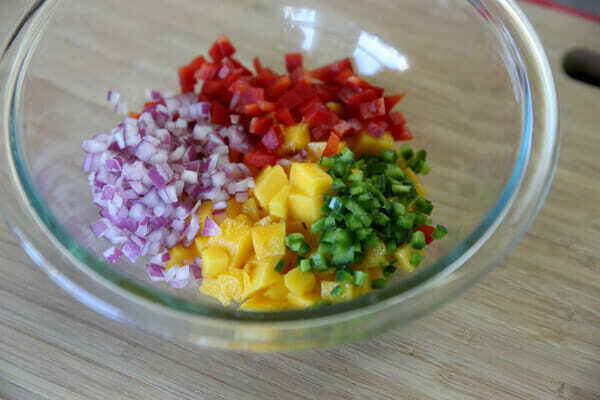 Combine mango, red onion, bell pepper, jalapeno, cilantro, and lime juice in a bowl. Sprinkle with a couple pinches of salt and a few cracks of pepper. Gently stir to combine and place in fridge to chill. Place beans, water, cumin, coriander, onion and garlic in a microwave-safe bowl and stir. Cover with plastic wrap and prick plastic with a fork to vent. Microwave for about 1 1/2 minutes (microwaves vary) until beans are hot. Use a fork to lightly mash beans, leaving some beans still in tact. Season with salt and pepper to taste. Lightly brush pan with a little oil and place tortillas on it. Sprinkle tortillas with pepper jack cheese (I use a generous 1/4 cup on 6-inch tortillas) and cook until cheese is melted and tortillas are toasted and golden brown. 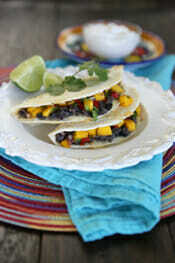 Remove from heat and divide bean mixture between tortillas, top with mango salsa and fold tortillas in half. Use a pizza cutter to cut into wedges. Serve with sour cream if desired. Well, you had me at your strawberry-Nutella-roasted-marshmallow concoction, but I did manage to read on. So glad I did because I too love the sweet flavor mixed with the savory as you dish up so temptingly here! Gotta get me the cheese, and then I’m on it! Pinning this! I love the mango is these! Yummy! What an awesome flavor combination — YUM!! Aaaand…now I’m obsessing over those strawberries. Wow! This sounds delicious! Love the flavor combinations! You lost me at the Berry-mallow-ella. That sounds incredible! That looks delicious! All of my favorite flavors! I love when you post new recipes and I already have the ingredients at home. Truly serendipitous. 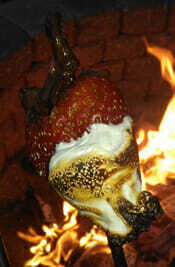 I never even thought about using marshmallow cream and roasting it – YUM!!!!!! Oh man. Strawberry + Nutella + Marshmallow FLUFF!?!? That just changed my life. 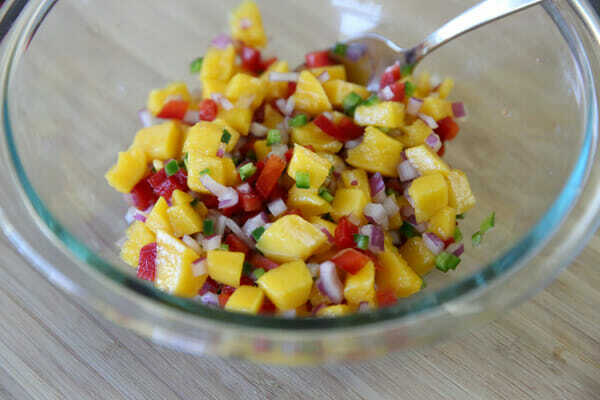 Also, I love mango salsa, so this sounds like an easy, delicious lunch or snack. I get so excited to see what you guys are going to post next!! This is my kind of recipe…well anything that involves black beans is really my kind of recipe 🙂 Can’t wait to try this! These came out gorgeous! I love the addition of mango. You can NEVER go wrong with mango! I’m especially pleased that this one has a dessert recipe as a bonus. My husband who eats everything doesn’t like mango. It’s a strange family trait, I think. 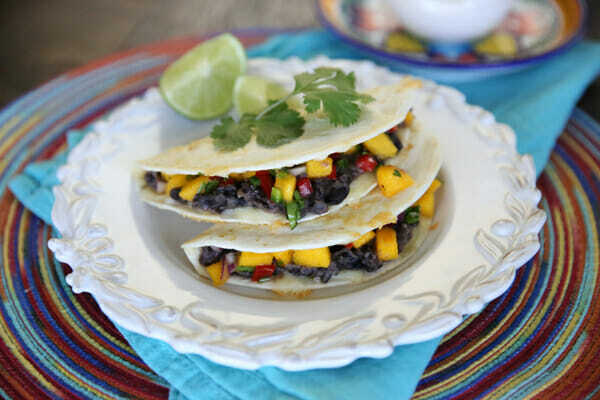 Is there a good substitute for mango in these types of recipes? pineapple maybe? It depends on how they’re being used. Pineapple often works with the flavors that are usually used in mango recipes, and peaches often make a great sub for both sweet flavor and texture/color. I made this for dinner last night….I will be making it at least once a month. LOVED it! I may try fresh peaches this summer instead of mango, then grill them on the bbq! That would be yummy too! Mmmm, that would be super yum! I made these last night and they were AMAZING! Thank you, thank you! love Love LOVE!! Made these last night for dinner and they were fabulous! We gad some serious counting hiw many each person got so all was “fair”. I told my kids I would now be craving these regularly. Thanks for continual fresh & fantastic recipes!! 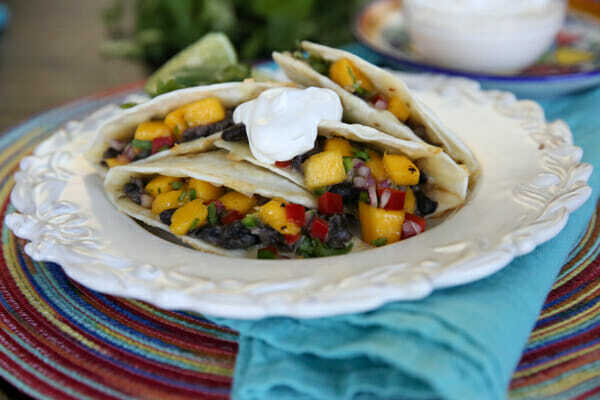 These look fantastic, and I might sub Costco’s mango salsa when I have to make it even easier. Love! This looks like a yummy recipe. I can never find good mangoes where I live, so I might substitute peaches. Thanks. We eat some form of quesadillas about once a week, and you just blew my mind with the way you toast up the tortilla and cheese and THEN fold it in half! Ha! I always lose some fillings trying to flip the quesadilla. So thanks! Bought all the stuff to make this for dinner tonight and when I got home from the store, I found that all 4 of the mangos I’d picked were bad! I happened to have a couple tomatoes on hand and substituted those and it was still super yummy! I happened to pick up a mango from the grocery store on Monday and when I saw this recipe I had to try it. It was so delicious I went and bought more mangos and we had it again tonight. 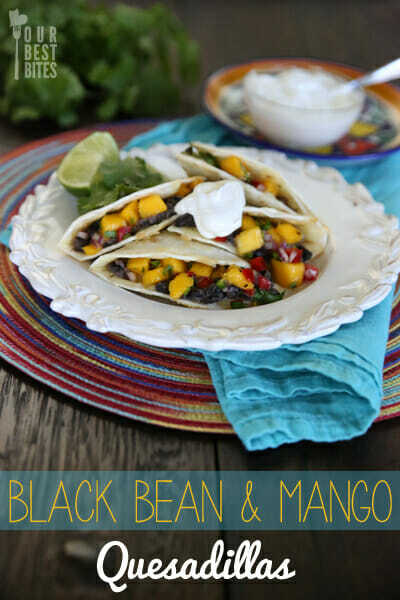 I LOVE fresh mangos and this recipe is so incredibly yummy. Thank you for sharing. Made this last night and it was awesome! Everything looked so beautiful and gourmet. Next time I’ll probably leave the jalepenos out because the kids and I are on the wimpy side, but I can’t wait to make it again! Have you tried these with shredded chicken? I’m thinking they’d be delicious! Yep, I have- and they’re great! Made the quesadilla for dinner last night … my kids LOVED it. They ate it without the mango salsa but they just raved over it. I made a version with chicken in it for my meat-eating counterparts, but they preferred the non-meat version … and that’s saying a lot!!! Just made these and they were mind-blowingly delicious. Thanks for sharing your brilliance. These were wonderful. I left out the jalapeño…. my family can’t take heat. But the pepper jack cheese was just the right amount of heat for us. This will become a go to meal for us! These are delicious! Can’t wait to make them again. These were easy and delicious. They are a new family favorite. We even served them to guests once. One time, the mangoes I bought were terrible. I happened to have a good pineapple, so I threw fresh pineapple in the salas, and that was delicious, too. ❮ Previous Post Previous post: Retro Week Goody Bag Giveaway!